Is Hair Thinning From Stress Permanent? Many myths are associated with hair loss. You won't lose more hair if you shampoo daily or wear hats or hairpieces, nor will shaving thinning hair make it grow back any thicker. One type of hair loss, telogen effluvium, can be caused by physical or emotional stress. However, yet another myth attached to hair loss is that thinning hair caused by stress is permanent, says the American Hair Loss Council, or AHLC. There's more than just one cause of thinning hair, according to MayoClinic.com. Telogen effluvium, which is caused by physical or emotional stress, disrupts your hair's normal growth cycle. Hair goes through a stage of active growth, known as the anagen phase, which can last for up to three years. The telogen phase of growth is when your hair rests; this phase can last for up to four months. Telogen effluvium occurs when more hairs than normal are pushed into the resting phase of growth. More women than men experience telogen effluvium, says the AHLC. Various emotional and physical factors can cause telogen effluvium. According to MayoClinic.com, it might occur after the death of a loved one or another emotional stressor. However, it can also be the result of physical stress caused by abrupt weight loss, high fever, nutritional deficiencies, surgery and illnesses such as thyroid disease and anemia. The AHLC states that telogen effluvium may be caused by medications, such as those used for gout and high blood pressure, as well as vitamin A taken in high doses. Other common causes of this type of temporary hair loss are related to fluctuations in hormones caused by pregnancy, menopause and use of oral contraceptives. 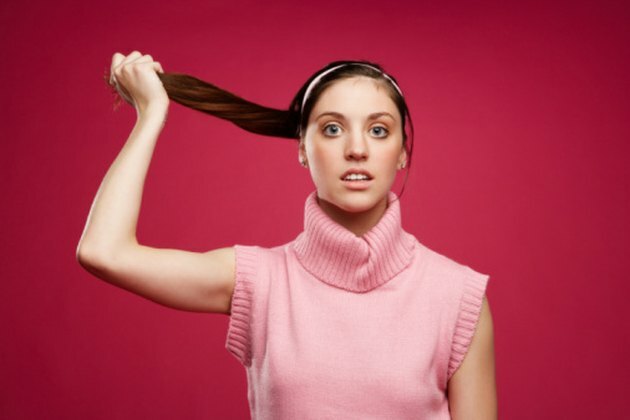 Hair that thins out because of stress does grow back, but it can take several months. You might not experience thinning follicles right after a stressful event, says the AHLC. Most of the time, there's a three-month delay before you notice hair loss. It may take another three months before your hair begins to grow back, meaning that it may be six months or even longer before your hair returns to its former thickness. Telogen effluvium isn't the most common type of hair loss. According to MayoClinic.com and the AHLC, most hair loss has a hereditary factor -- and it's also permanent in nature. Androgenetic alopecia can affect both men and women and accounts for almost 95 percent of all hair loss. If your hair comes out in great amounts when you wash or style it or if it comes out in patches, see your doctor rather than self-treat it, advises MayoClinic.com. You might have an underlying medical condition -- such as anemia or a thyroid disorder -- that hasn't been diagnosed. According to the AHLC, some medical conditions that cause telogen effluvium can be diagnosed through a blood test.